Making Holiday Bark is almost more like making art and playing with your food than it is cooking or baking. When I was younger I used to absolutely love sketching, painting, collaging, sculpting, or any other artsy activity that I could just spend hours completely focused on. I seem to have lost this hobby in the daily grind somewhere after high school, but I still miss it and have hopes and plans to pick it up again someday (though, no day like the present, right?). 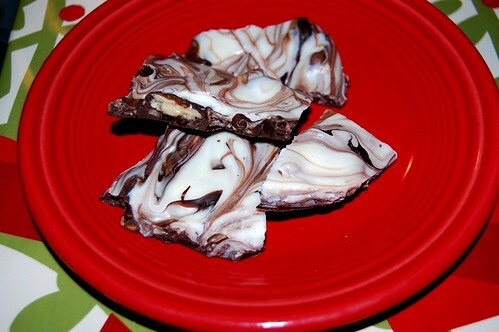 Making Holiday Bark helps me get my artistic fix, and in delicious, edible form! Making any kind of bark candy can be as simple or as detailed as you make it. If you have kids, they will probably love attempting to help mix and swirl the chocolate (and get it all over their faces). If you’re setting out trays of food for a Christmas or New Year’s party or would just like something fun to bring to work, this is a very attractive option. In its simplest form, you can get away with using only two kinds of chocolate and one kind of nut or flavor. No cooking or baking is required, though if you’re really looking to unlock the full flavor of the nuts then you may want to heat them in a shallow pan until warm and fragrant. You can even make bark while waiting for Christmas cookies to come out of the oven. Basically, when you think you might explode if you have to make one more Christmas cookie – Holiday Bark to the rescue. And, if I left this part out, it tastes and smells heavenly. Don’t forget to use ingredients that you enjoy and just have fun with it! Line a jelly roll pan with parchment paper. Stir in nuts to the bowl containing semi-sweet and bittersweet chocolate. 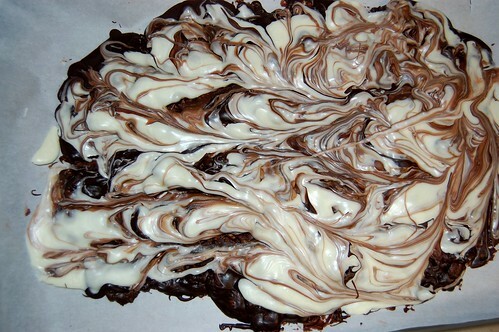 Spread the chocolate and nut mixture on the parchment paper using a rubber spatula. Drop spoonfuls of white chocolate over this, and swirl the chocolates using a fork or skewer (I used a fork because the nuts make it a little tougher to swirl). Refrigerate for approximately 1 hour until hard. Break bark into large chunks and store in your refrigerator until serving. « Even Healthier Mashed Potatoes – Cauliflower "Mashed Potatoes"
This holiday bark look mighty gorgeous, and sound really delicious too. I’ve been making way too many cookies, maybe I should try to make barks, and candies. It also sounds like really fun for the kids too. Btw, your little girl look absolutely cute! Julia – thanks a bunch! i thought about using peppermint extract, but my love of pure chocolate won me over. what kind of truffles did you make? that sounds great! Elra – Bark provides a much needed break from baking cookies; why drive yourself crazy? Thanks and have a great holiday! Wow, this looks really good and I’m especially excited that this can e made without a double boiler. Happy holidays! CurvyGurl – Hope it turns out well for you! Thanks for the comment.